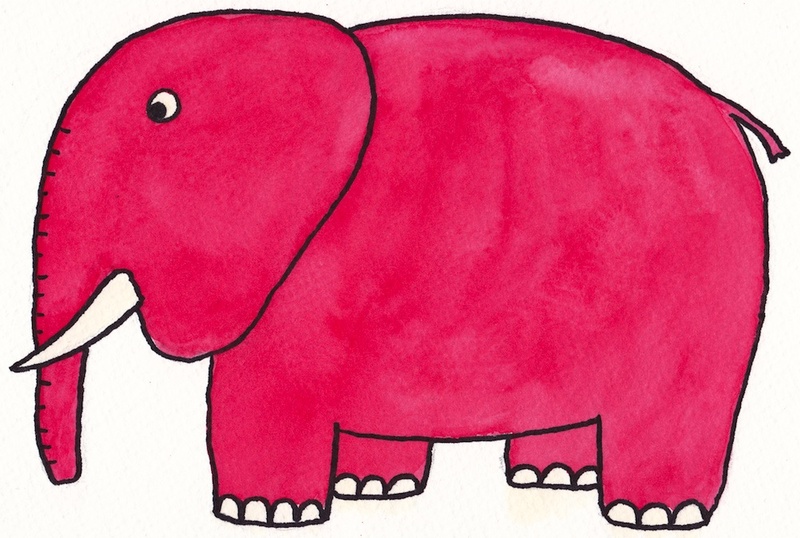 What should you do with the elephant in the room? The elephant in the room usually refers to the thing that’s not being said. Typically the thing that is not being said should be obvious, but it is not. Things that don’t get said have a tendency to create a bit of stress! Consider what happens if what needs to get said doesn’t get said. Generally the cost of bringing the elephant into the room is one in which people have to contend with something big. If the big thing is in the room, this might generate anxiety or even anger. The participants in the room would have to tolerate a conversation in which stuff was out in the open, even if it meant dealing with things that are hard to talk about. However, if the elephant could be invited in to the room and managed, it might just be the case that elephants would eventually become easier to handle. One quick tip for bringing the elephant into the room is to describe in an accurate, matter-of-fact way what you have observed. This helps lower defensiveness and doesn’t come across as an attack. Keep your tone of voice neutral and curious, and be ready to hear the other person out- even if what they are saying is hard to hear. 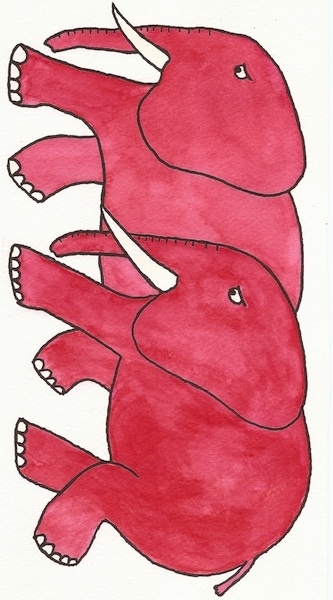 Consider that the other party may find it just as difficult to talk about, and it may take more than one try to bring the elephant into a place where it can be seen for what it is. 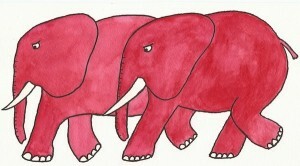 Consider: What is it costing you to keep the elephant out of the room? The cartoon elephants are here! Click here for The Emotional Extremist’s Guide to Handling Cartoon Elephants: How to solve elephantine emotional problems without getting run over, chased, flattened, squished, or abandoned by your true cartoons. Is this book for children? The intended audience for this book is adults (hey, adults need cartoons too!) and is fine for adolescents. Younger age ranges may have some difficulty with the abstract reasoning and the metaphors, and may not grasp all the concepts and big words. However, the big pictures, changing fonts, and fun graphic design makes this an attractive book for young kids (my 9-year nephew zipped right through it). Why are the elephants in the male gender form? I used “he” and “him” when referring to the elephant to make the book simple and less wordy. I did not have any gender specific intentions. If you experience your elephants in the female form, you are welcome to take your own copy of the book and change all the pronouns. Cartoon elephants do, indeed, exist. The question is whether or not you believe in the existence of your own elephants. In truth, life will be much harder for you if you go around pretending that you don’t really actually feel the way you feel. In reality, cartoon elephants do not go away because people ignore them. 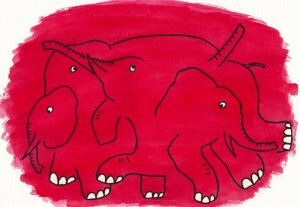 Paying attention to your cartoon elephants means doing some hard work of figuring out what, exactly, is being felt. It is certainly possible that your cartoon elephants are right there, trying to get your attention. Perhaps there have been so many barriers to their discovery that ignoring them takes twice as much effort as figuring out what they are trying to tell you. In reality, it is extremely difficult to collect cartoon elephant data. 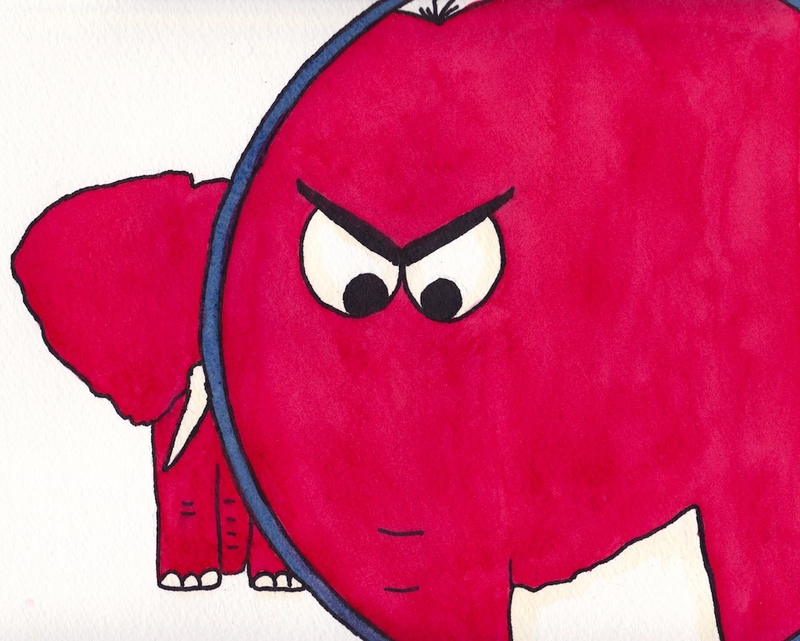 It is even more difficult to collect cartoon elephant data when people don’t believe cartoon elephants exist. Your emotions are there: Alive, present, and real. Stop pretending they are not. Making space for your jumbled, confused, disorganized, messy, or incoherent cartoon elephants (emotions!). This is a picture of what your elephants (emotions!) might look like if they get bunched up like a bad traffic jam. 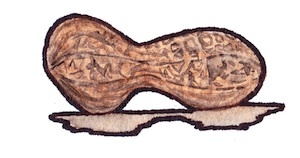 A lot of effort may need to go into sorting, identifying, labeling, and describing your elephants. It is quite possible that you neglect to do this because you do not believe in the existence of cartoon elephants. Or maybe you do not think your elephants are important, other people tell you your elephants are not important, other people blame you for the situation that you are in, or other people do not offer very much space to allow the assortment and organization of your true cartoons. Here are some tips for sorting your elephant situations: Gently notice your elephants. Make space for their messiness, disorganization, or lack of words. Don’t get hung up on WHY you feel the way that you do. Often people feel if they can not explain what they feel, then the unexplained should not have the right to exist. When you start to make space for experience, elephants will slowly start to sort themselves out. When people can’t really organize and articulate experience, it can result in incoherence. 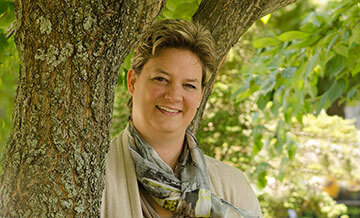 People need coherence to feel organized, communicate effectively, and exert influence. 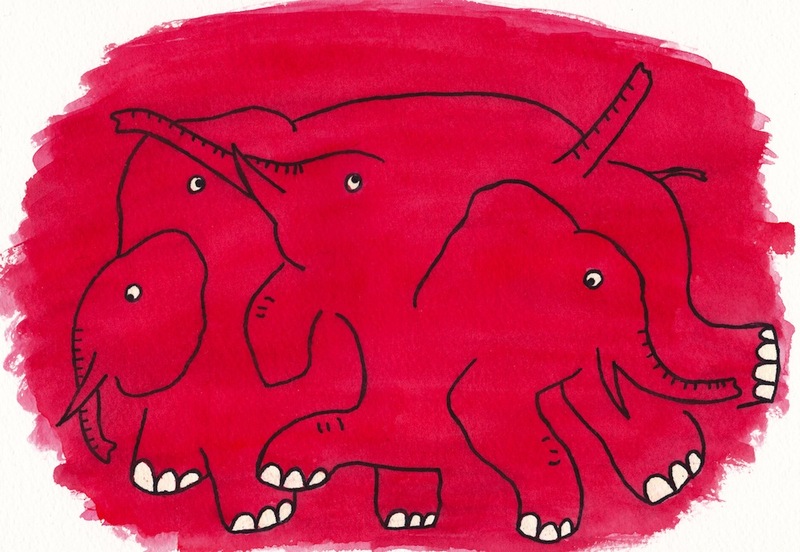 If you have nothing more right now than a jumbled pile of elephants going on, make sure that you make some space to be curious, allow elephants to exist (cartoon elephants do, indeed, exist! ), and give them a bit of breathing room. It is possible that this task is twice as hard when people around you are unable to do this with you. Remember to be patient with your elephants, because impatience can often result in a bigger jumble. And, if you’re not used to making space for your elephants, it may take a lot of practice. Who is in control? You or your cartoon elephants (emotions!)? Emotions that control peoples’ lives prevent them from doing the things they love, working hard to achieve goals, tolerating pain in order to get somewhere in life, building mastery over situations that may feel threatening at first, and participating fully in what life has to offer. Anxiety can prevent us from being social, meeting new people, taking risks, reciprocating kindness or disclosure, and showing people our vulnerabilities. Anxiety can get in the way of going to school or work, driving, attending public events, talking to people we want to talk to, and going to the places that we want to go. Some people’s lives are so restricted by anxiety that they can’t leave their house. People that feel more in control of their lives and their emotions will sometimes do things they don’t feel like doing. This may have something to do with seeing the value in doing the behavior- or the consequence in not doing it. If someone was terrified of driving and they learned how to drive, their ability to master new things (despite anxiety) would increase. If someone was able to hold their ground despite having someone angry with them, they may feel more influential when around angry people. If someone could sit through a class despite being worried that they won’t know the answers, they would get better at sitting through class. In some cases, emotions give us good information about ourselves and our environments. They are like alarm bells that tell us what to avoid, what is threatening, what is scary, and what is unworthy of our efforts. They have good reasons for being around and are worth paying attention to. But what if emotions- at least some of the time, weren’t giving you accurate information about your environment? What if you could do anything you wanted- if only you could tolerate your emotions long enough to accomplish it? Consider the value of approaching something that you would rather avoid, tolerating an emotion long enough for it to change, or facing an unwanted task despite how you feel about it.